There are numerous sites and conditions inside the mouth better served by plaque removal methods and devices other than toothbrushing. Examples of these sites include fixed prostheses, crown margins, in between roots of multi-rooted teeth, orthodontic appliances, the tongue, implants, and dentures. Why brush in between your teeth? Incomplete plaque removal can increase the rate and growth of new plaque. Allowing plaque to remain on some tooth surfaces can facilitate development of complex organisms on other cleaned surfaces. Individuals who clean interproximally on a daily basis have less plaque and tartar. Interproximal plaque removal is beneficial for preventing gum infections as well as for reducing or eliminating diseases in these soft tissues. Gum disease and cavities are more prone in interproximal areas. Prevention of tooth decay can be facilitated by effective daily interproximal plaque removal. Interdental brushes (also known as interproxiaml brush, proxa brush or proxy brush) are small brushes which are attached to a handle intended to clean the spaces in between teeth and come in a variety of designs. Some of the designs have a non-replaceable brush whereby the entire device is discarded when the brush is worn. The brushes are tapered or cylindrical in shape and are available in a variety of sizes. The core of the brush that holds the bristles is made of plastic, wire, or nylon-coated wire. Interdental brushes are preferable to the use of dental floss for cleaning between teeth where the gum does not fill the space between teeth or where root concavities are present. fixed prosthetic appliances with spaces that are large enough to easily insert the device. They may also be used to apply chemotherapeutic agents into areas between teeth as well as exposed molar roots. When planning to purchase interdental brushes, the appropriate brush diameter should be determined. The diameter of the bristles should be slightly larger than the space to be cleaned. 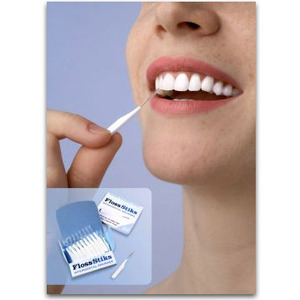 The brush can be moistened, and then inserted into the area at an angle approximating the normal gums contour. An outer to inner movement is used to remove plaque and debris. Caution should be exercised to prevent damage to the tooth or soft tissues from the firm wire or plastic core of the brush. Though implant abutments can be easily cleaned with an interdental brush, extreme caution should be exercised to prevent scratching of the titanium surface. Only plastic coated wires or foam brushes are recommended for use on implants. 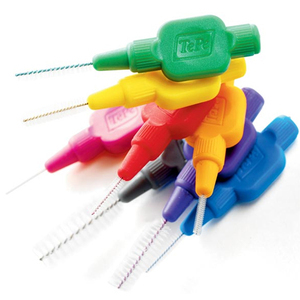 How are interdental brushes different from single-tufted brushes? Around dental appliances, including implants and orthodontic wires and brackets. By softening in very hot or boiling water, handles of some single-tufted brushes can be bent in order to allow easier access to difficult to reach areas. The end of the tuft is directed into the area between teeth by combining a rotating motion with intermittent pressure. What are the other ways to clean in between teeth? There is no universally accepted oral hygiene device. The appropriate oral hygiene regimen is determined according to the dictates of the oral condition, personal preferences, dexterity, and lifestyle. However adequate instruction in the use of any recommended device must be provided.